Old Native American wisdom. We need to gather as one people to save earth and all people. I have been lucky. Many kind Native Americans took me under their wing and taught me how to find peace. At the Mall I went to the so-call Native American store. A Middle Eastern man tried to sell me a Chinese made items. I touched a Medicine Wheel. I told him: "A proper Medicine Wheel has the power of the four winds." I touched a Dream Catcher." A real one would protect your spirit and keep bad dreams away." He grinned at me. He didn't understand a word that I have spoken. He told me. "It does the same things." I left the store with nothing. I sat with my Apache Friend and his family outside the gate of Fort Hood, Texas. I sat and listened to him. His skin hardened by the Texas sun. I came and sat with him every Saturday for many months. He had a story for every item he sold. I brought him food and water. His stories were passed on to him by family and elders. He gave me a Medicine Wheel. He rose up and made a circle with his hands. He told me. "All people are part of the circle of life. We all have a purpose, he had sadness in his voice. We Apache and Native Americans were responsible to protect Nature. We did a poor job." "The white people were responsible for the fire. They shared their gift and now fire is held in every corner of the planet. His eyes looked at the ground, then he raised his eyes and looked to the sky. The fire was taught Atomic and nuclear power too well." "The black people held the strength, wisdom and honour. The wisdom of the black people lost direction. We need their strength before we kill off all that is good." "The yellow people have courage, leadership and clarity. The gentle and calm souls will be necessary for this world to seek peace." "The medicine wheel is a compass to all life. We must know all four directions." 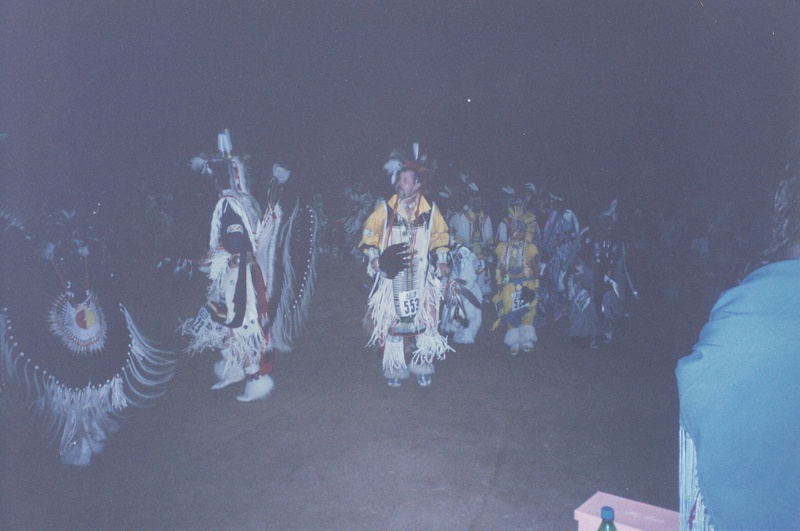 At a Pow Wow in Texas a few Native Americans danced and invited all of us to join the dance of friendship. A old Apache man moved around the circle. Burned sage and blessed everyone who came. He welcomed us. He began to speak. "We were the last Americans allowed to dance our Native dances. We were the last allowed to speak our language in public. We go on and hope for better days." He blessed all of us and his kind eyes show respect for all. He raise his hands and spoke to the sky. "Teach us the four winds. Allow us to trust our brothers." I'm proud of my Ojibwa heritage. I'm proud of my Mexican/white heritage. The Medicine wheel showed us we are one. We need to work together. Red, black, white and yellow were given gifts. Old Apache raised his hands to the sky. Then created a full circle. He moved slowly around the inner circle and looked in all our eyes. East wind - Yellow people - Path of light - Spiritual - courage. This is a view of many years of learning. Every teacher tells the story differently. I believe we are one people. Peace will come when we learn to work together. 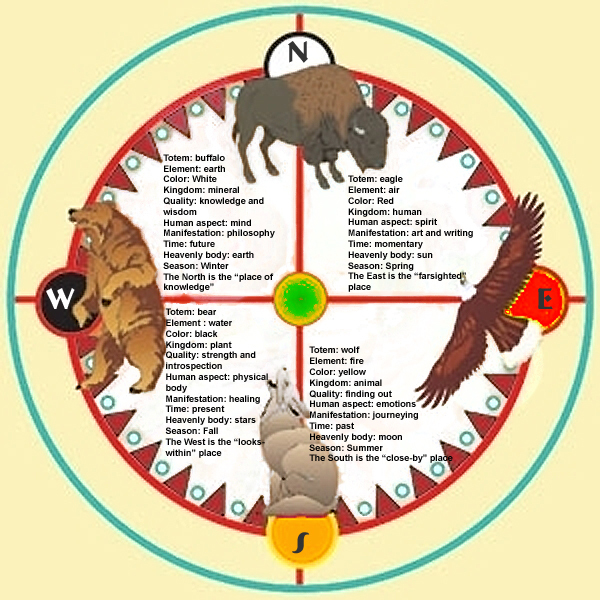 Black, White, Red and Yellow are the four corners of the Medicine Wheel. All with important gifts to bring to achieve peace with each other and the planet. If mistakes. Please tell me. Never too old to learn. Thank you Neville. The Medicine. A symbol of peace. One people and one earth. Thank you Alexandra. One earth and one people. We must get along. I pray we can one day. What do you mean by white, yellow, black, and red people? Are these meant to be races? What about arabs, finns, jews etc.? I agree peace must be made among all peoples. How do we live in harmony without giving up what makes us special and unique? Humans may create war but nature will inevitably make peace; with or without human beings. I think all people of all races had a responsibility to protect nature, but we all failed, however nature does not need us to protect it. We need nature to protect us. What do you mean by white, yellow, black, and red people? Are these meant to be races? What about arabs, finns, jews etc.? I agree peace must be made among all peoples. How do we live in harmony without giving up what makes us special and unique? Humans may create war but nature will inevitably make peace; with or without human beings. I think all people of all races had a responsibility to protect nature, but we all failed, however nature does not need us to protect it. We need nature to protect us. I agree. This is a Native American prayer. Looking at life, not religion. Nature don't need us. She .. read moreI agree. This is a Native American prayer. Looking at life, not religion. Nature don't need us. She will outlast man and his greed. I appreciate the comment. Back on writerscafe for the first time and two years and this is the first page I visited. Every time I look at some of your writing I find something truly unique. It's always a treat. This was a great way to get back into the swing of things. Thanks for sharing Coyote! Glad to have you back and thank you for reading and the comment. Beautiful. The world can always be a better place with more love and understanding. We do need to think of ourselves as one people. We're all human. Thank you Chris for reading and the comment. One earth and one people. I haven't and I will research. Thank you for reading and the comment. You are so wise. This is beautiful, Coyote. Hope you're doing well. It has been very long. You are so wise. This is beautiful, Coyote. Hope you're doing well. It has been very long. Thank you Simran. One people and one earth. We must get along. This is such a powerful work of love and wisdom. It's like a treatise, a guide on human harmonious relations. To me, this is what writing is about: always learning something fresh that adds to one's existing knowledge of humanity and the positive elevation of the human spirit in harmonious coexistence. This is such a powerful work of love and wisdom. It's like a treatise, a guide on human harmonious relations. To me, this is what writing is about: always learning something fresh that adds to one's existing knowledge of humanity and the positive elevation of the human spirit in harmonious coexistence. My friend. We need the four corners of the word to work as-one. We need every child to have food, sh.. read moreMy friend. We need the four corners of the word to work as-one. We need every child to have food, shelter, safe place to live and opportunity. Thank you for reading and the kind words. I do appreciate. This poem is epic! I love the cultural history, the reference and the wisdom and knowledge this piece contains. It's all well rounded, its dynamic as well and very moving as well as inspirational. The thoughts in this poem express interesting traditions, and is an overall eye-opener. Thanks for sharing this Coyote! Thank you Carthage. I wish we would learn. One earth and one people. Aye, same! There was a line from out of a song that really hit me once after listening to it... and .. read moreAye, same! There was a line from out of a song that really hit me once after listening to it... and it went along the lines of... "Skin different, but the same color we bleed." Really was something to think on after hearing that part of the song. A great song. I pray for peace every day. Too many days of war. An excellent mixture of prose poetry and conventional poetry used to emphasise the need for us humans to group together and work together for the common good. I am taken in by the combination you've made of some biographical lines together with descriptive lines about the Native American people. I am thoroughly impressed overall. Thank you for reading and the comment. The four corners of the world must get along. Or we shall fal.. read moreThank you for reading and the comment. The four corners of the world must get along. Or we shall fall. I love this poem a lot. The inspiration alone humbles me into finding further peace. Great work and thank you for sharing. Thank you Christian. I appreciate the comment. Please show me the way to..
Two out of three ain't ba..